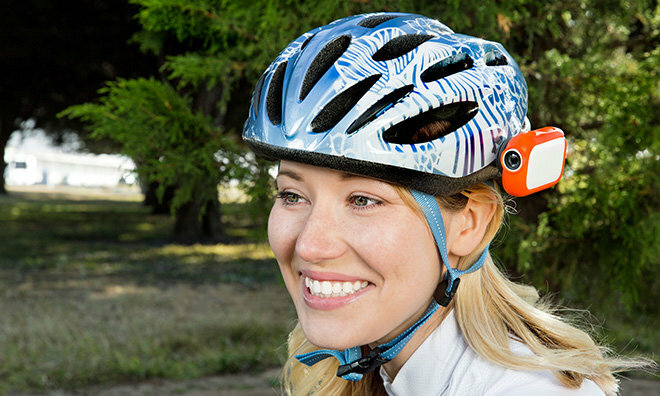 Graava, a startup based out of Sunnyvale, Calif., on Tuesday announced a new action cam platform that processes motion sensor, GPS and Apple Watch heart rate data to intelligently edit down hours of footage. Instead of competing on ultimate sensor resolution and hardware specs, Graava's eponymous camera system focuses on post production software, often a pain point for casual and pro-am filmmakers. Using data from onboard sensors, Graava analyzes captured footage, picks out the best shots and snips off the slough to fit a desired video length. Or at least that's the idea. From start to finish, filming with Graava is designed to be as simple as pushing a button. Recorded video is synced with sensor data for later editing, allowing the AI to pick out probable highlights associated with spikes in motion or sound. As an alternative, users can say, "Graava," while recording to manually tag highlights, a function similar to GoPro's HiLight Tag. The company is also working to integrate data from Apple Watch's heart rate monitor. When a filming session is complete, users specify a desired clip length using Graava's iOS app, which sends content to the cloud for appropriate fat trimming. Graava videos can be set for six-second Vines or 15-second Instagram videos, for example, and with hooks into social networks, sharing is an equally simple process. Carrying on with the social theme, Graava cameras have the ability to seamlessly stitch together footage from other Graavas in the area. 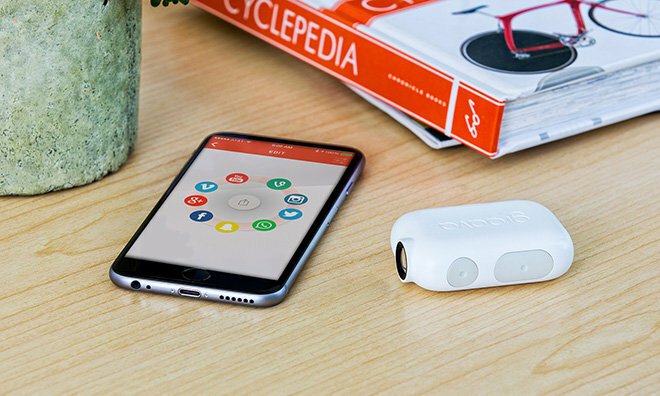 For example, if the system determines that a friend is using Graava nearby, it will request to compile footage from both devices into a single video, outputting a continuous clip with multiple perspectives. Graava packs an 8-megapixel imager with 130-degree area of view, accelerometer, gyroscope, GPS module and communications suite into a chassis about the size of a Tic Tac box. Output quality sits at the lower end of the action cam spectrum with 1080p at 30 frames per second or 720p at 60 frames per second. A "Hyperlapse" mode supports the same 1080p and 720p resolutions, but bumps the ceiling up to 4K. Graava pegs operating time at three hours with Wi-Fi turned off. Charging is accomplished via USB or the included wireless charging dock that doubles as a stand filming stand. Both Qi and PowerMat standards are supported, meaning owners can use existing induction chargers or stop by the nearest Starbucks for a quick power up and a latte. The firm tells us a full charge cycle —from zero to 100 percent —takes about two to three hours, but that could change as the system is still being tweaked. Graava is available for preorder now at a discounted price of $249. Once units start shipping in early 2016, prices will jump to $399.